Remember the skull ice cube tray I used to make sugar skulls the other day? Well, there are several other crafts you can make with the same ice cube tray. 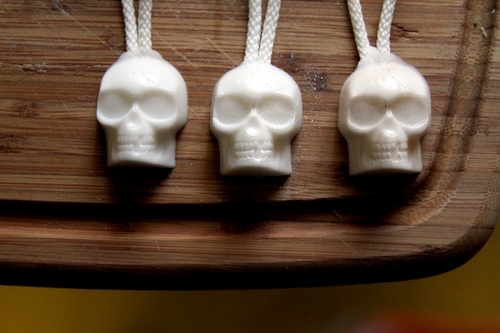 I just made some teeny skull soaps on a rope, which would be fun gifts to give away at a halloween party or maybe even to trick-or-treaters (just be sure to label it clearly as soap! and “DO NOT EAT” wouldn’t hurt, either!). Making melt and pour soap is a VERY easy activity. It would be fun for a slumber party or scouting activity. 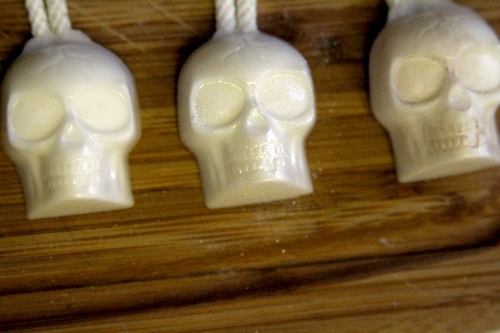 You could even make these spooky soaps on a rope for fundraisers. 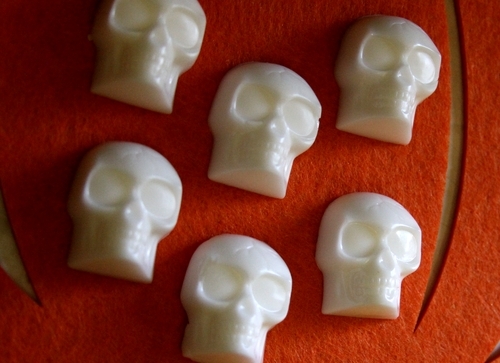 Or, omit the rope and just make teeny tiny spooky guest soaps. I got my soap-making supplies from Brambleberry because it has good prices and a great product, as well as being close to me in location (less costly shipping, and less time in transit). If you are going to make soap, I highly recommend buying your supplies online instead of in a craft store. The prices are a lot better, and the quality and selection are far superior. I just got a pound of melt & pour soap and one ounce of fragrance oil for about $3 each – for a total of $6 for this project. I got four trays of skull soaps from the single pound of soap, which means I made 40 soaps for about $6. Note: Don’t use the fragrance oil you can buy at the dollar store in the candle section. It is not safe for using in soap or anything you use on your skin. If you use your silicone tray for soap-making or other non-edible crafts, don’t use it for any food-based crafts. Just pony up an extra dollar to keep a separate food crafting tray. Pre-cut shoelaces or jute string in approximately 8″ pieces. I got 4 strings from each shoelace. Melt soap according to instructions. I chopped mine into 1″ squares and melted it in a pourable glass measuring cup. Then I microwaved it on half power for one minute at a time, stirring with a spatula between minutes until it was completely melted. After it’s melted, add fragrance oil if desired, and stir to incorporate. I used “Basmati Rice” and “Wasabi” fragrance oils from Brambleberry. Also note, you might want to skip the fragrance if your recipients have perfume allergies. 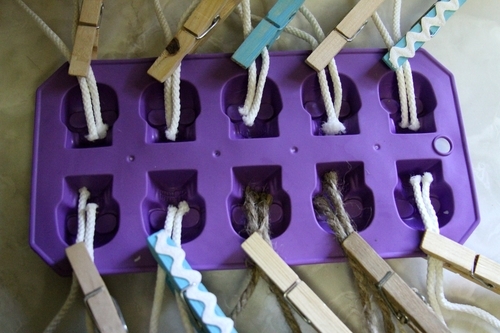 Pour melted soap into mold, taking care not to over fill, and making sure strings are embedded in soap. (If you do overfill, you can scrape off any excess after they are cooled). Let soap cool until firm, and then gently pop out of mold. If desired, brush loose sparkly eyeshadow over skull afterward to help highlight and define. (I used some silver sparkly loose eyeshadow I got at the dollar store on the center skull, and I tried some matte brown eyeshadow on the skull on the right). Here’s what the back of the soaps look like. Clever idea, especially since you’re re-using the mold from another project. I’m not into skulls at all, but I would consider making this project using a different mold. 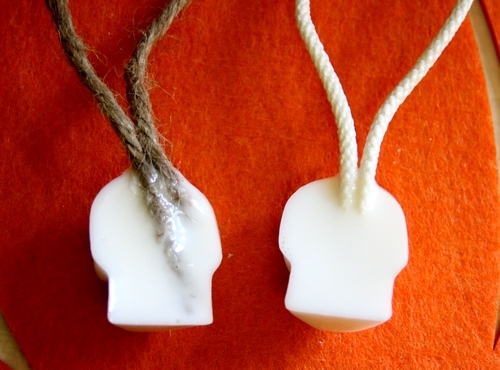 Soap on a rope in Christmas shapes would make a cute holiday gift or stocking stuffer. I have to try soap making. I’d just assumed that it would be expensive to try, but the prices you’ve quoted here seem really reasonable for making gifts! Woot! I actually did this a couple years ago, I painted they eyes and rubbed on some brown, the paint washes off quickly and just goes down the drain with the dirt. :) I just used plain old craft paint. I wonder if it would work to make skull candles? Hmmm. These turned out so cute! I love what you did to make economical ‘ropes’ and holders for the project. What a fun idea. I would love to get or give one of these at a party. Thanks so much, I’ll be linking. That’s so awesome! I’m going to try this out and use it as my halloween necklace. It would go so well with my costume! Thank you for the tutorial! 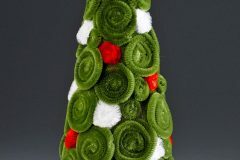 If you want to promote your cool craft projects, stop by at http://www.makemania.com You can take a look at similar craft works I’ve done as well! 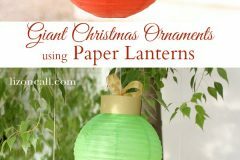 Pingback: Green Halloween: How can I reuse or recycle Halloween decorations? | How can I recycle this? 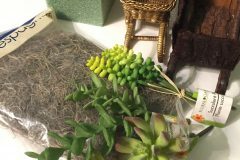 Pingback: Green Halloween: How can I reuse or recycle Halloween decorations? You have such amazing ideas! 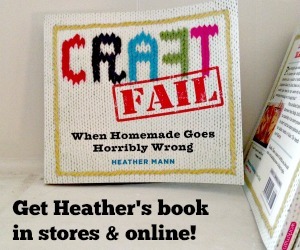 I love how you have a variety of crafts! I am trying to do the same for my blog. I love dollhouse miniatures, clay, papercrafts, anything with my kids, etc. 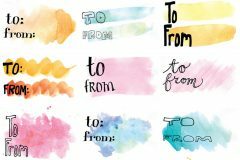 I will bookmark your site and put you on my favorite links! Thank you for your great ideas!